Celebrating Grow Heathrow’s 3rd birthday! Last Saturday, I headed off to Sipson to wish the wonderful Grow Heathrow project a very happy third birthday. Although they have the possibility of a legal judgement looming over them that could – sadly – lead to their eviction from this fantastic site, they still know how to throw a great birthday party – and I hope they have many more! Now that the election is finally over and the dust is settling on the chaos, here’s something more interesting you can do if you’re in London over the weekend. 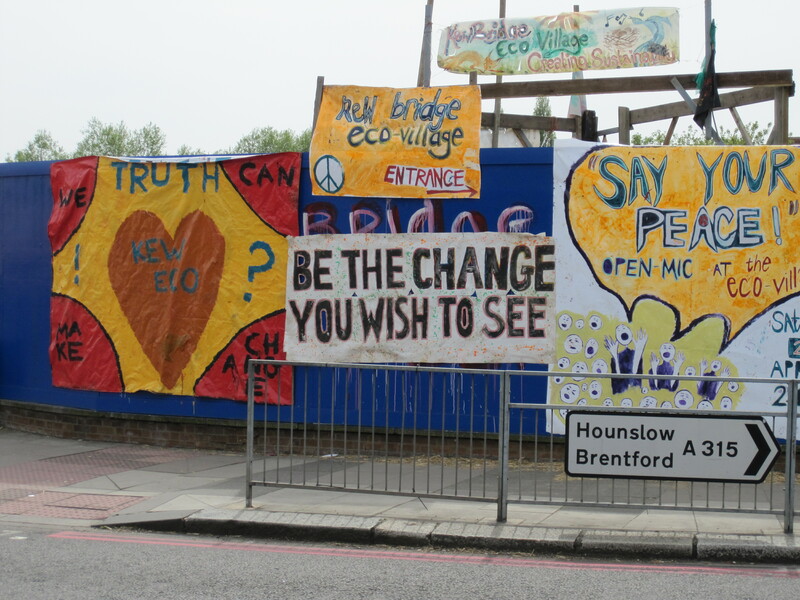 The Kew Bridge Eco-Village is holding a two day Spring Festival this weekend – so come on down on Saturday or Sunday (or even both days!) between 12pm and 7pm to meet the villagers and get involved in some fun activities! Saturday is for the kids, so if you have little ones, bring them down – they’ll love getting messy potting out plants and having their faces painted by some of the best artists in the village, and they can also get involved in music, mask making, puppetry, story telling and more. Parents can enjoy a nice cuppa and a bit of peace and quiet! Sunday is more for the grown ups. There will be fascinating workshops on all sorts of interesting topics, great music (bring an instrument! ), an open mic session, poetry, a warming open fire and a communal meal. Bring yourself, your friends, and some food to share with everyone! This is a weekend of activities for everyone, and all are welcome. Come down for the Eco-Village experience, if you haven’t already – and if you have, come back and say hello! The Eco-Village is right opposite Kew Bridge mainline railway station (trains to and from Waterloo); look for the banners across the road as you come out of the station, which you can see in the photo above, and if you’re coming by bus, the 237 from Shepherd’s Bush, the 267 from Hammersmith and the 65 between Kingston and Ealing stop right outside. The nearest tube station is Gunnersbury, on the District Line, which is a 5-10 minute walk down the road. For more information, take a look at the Eco-Village Facebook group or the new Grow Your Own Village blog!